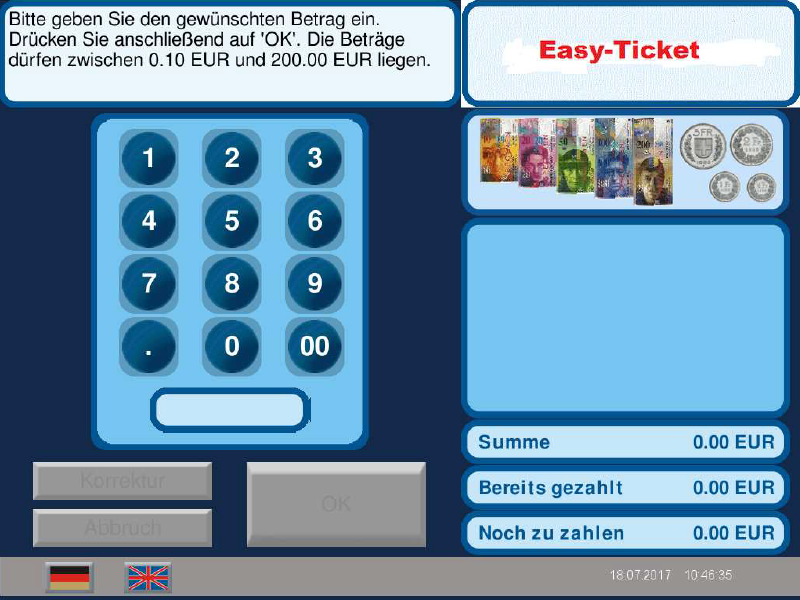 The application "Easy Ticket" enables the input of an amount of money via a simple to operate touch interface. After confirmation of the input the displayed amount can be paid in with coins and/or banknotes. The customer receives a ticket representing the total amount, if necessary with corresponding VAT receipt. This receipt serves as evidence for the payment of goods or services. Should the machine be unable to pay out cash, a credit voucher will be printed. The "Easy Ticket" application runs on a modern computer system under Linux. This hard disk free Linux version is characterized by its high level of operational reliability – no viruses, disk crashes, etc. For the purpose of accounting one can invoke a dedicated desktop on the machine. The statistics of the machine and the ticket sales can be printed out with the integrated printer. At the same time the sales statistic is saved on a USB data carrier.